Russell Jamieson became an Australian champion for the second time on September 22. He is a vastly different driver than the one who won the 125 cc title back in 2006, but this title was built on the back of the technical challenge of operating the latest Anderson Maverick and DEA engine package so far from their factories in a completely different environment than Europe. 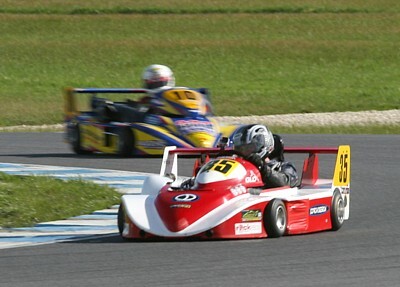 It is the path, albeit with different partners, forged initially by Zip BDH team in years past and more recently by Gary Pegoraro and the extended RMR Superkarts/Wizzer Race Engines team. Essentially a year behind Jason Smith’s Anderson-DEA operation that won the 2012 championship, Jamieson had the advantage of the later model to learn last year. 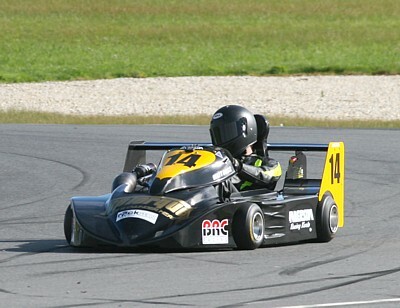 With a mid-year update during a successful excursion to the European Superkart Championship in Assen, the Netherlands, Jamieson arrived at Phillip Island with a package he knew could do the job. The Coach Design team expected 1:29 lap times and were suprised by the 1:28s that resulted. From the moment the computers were switched on Jamieson had a second per lap advantage over Gary Pegoraro and two to three on everyone else. By following the “Brock Crush” tactics of maximum attack early, Jamieson broke the back of the field. But for a wrong tire choice in the wet on Sunday morning Jamieson had the perfect weekend. Gary Pegoraro threw everything at Jamieson. A new Anderson Maverick chassis was imported for the purpose. He qualified under 1:30. He took the lead from Jamieson in the early laps of Race 3, twice. But in the end a pair of ignition failures in races 2 and 4 were “Wizzer”‘s downfall. Race 3 was the highlight as in heavy traffic Pegoraro reeled in Jamieson and the gap ebbed and flowed until Pegoraro hurled himself forward in the run to the chequered flag but was too far behind. This year was the strongest Pegoraro had ever been at the nationals, but the goal posts had been moved by Jamieson. While there was a definte “rest of the field” Warren McIlveen bridged the top two and the pack. Sporting an inline engine for the first time on a new Stockman MR2 chassis, effectively a full-factory effort from Brian Stockman, McIlveen did what no-one else could; take a win awy from Jamieson. On a wet track on Sunday morning and with Pegoraro parked with ignition fuse failure and Jamieson on slicks, McIlveen took victory, mastering the drying track in a manner only really matched by Kristian Stebbing in his Yamaha powered Stockman MR2 and Ilya Harpas who just ignored the fact that he had slicks on his Zip-BRC and went drifting. McIlveen was second for the round and third in the championship. Matt Bass put in a breakout performance at Phillip Island. Another debuting a new chassis, an Anderson Maverick, the Top Torque Engines team took a second and two thirds on Sunday, announcing firmly his cadiduture for the 2014 championship. The team were full of smiles on Sunday night, they had their own adversity to overcome, including a broken third gear. 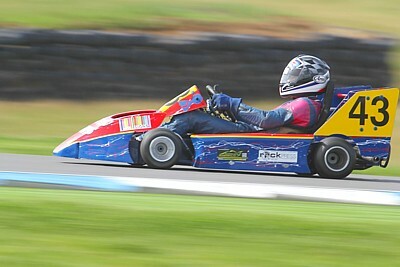 Jason Smith had a shocker of a weekend in the Fuji Xerox/Zahl 1 Karting/Middleton’s Printing Anderson-DEA. A huge spin over Lukey Heights in qualifying. A slipped tandem gear, originally mis-diagnosed as an engine sieze, followed leading to a lengthy Sunday night engine rebuild. In race 3 it all came good and the defending champion raced at the front again. Third was still on offer in the championship at the final race until his left rear tyre delaminated. Ilya Harpas (Your Amigo/Davtec/ Zip-BRC) battled valiantly throughout the weekend. The engine would need pull high revs in the big gears leaving the South Australian a sitting duck on the straights. Consistent finishing and aggressive driving of the power he did have gave him sixth in the championship. Victorian drivers Martin Latta and Brendan Luneman put bad luck in Sydney behind them and finished consistently. Luneman (Wizzer Race Engines Anderson-BRC) claimed seventh in the championship with a string of top six drives while Latta in the MJR Bricklaying Anderson-DEA had a series highlight of a third place in the wet of Sunday morning. Kristian Stebbing had plenty of pace in the Suburban Accounting Stockman-Yamaha. Reliability struck him down, including the strangest failure of the weekend. A flake of metal had broken off a link in the chain and was sucked into the ignition rotor by the magneto where it shorted the fuse. The engine was no longer charging the battery, but it did not go flat until over 24 hours later when Stebbing was in a brilliant second position in the Sunday morning wet race. It was a cruel blow. Chas Maddern had power to burn but in the end he too put his PVP away early. Mark Hanson also had a great drive in the wet in the Denture Professionals Zip-BRC to claim sixth while Michael Nicholas overcame a couple of spins on his national championship debut in his Stockman-Yamaha. Anton Stevens put the artmotorsport.com.au/Ciscos PVP-FPE away during qualifying as the engine started to develop an appetite for piston rings. After winning the Phillip Island round last year it was more than disappointing for Stevens.